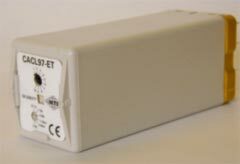 Electronic timer relay adjustable from 0.1 sec. to 10 h - 2 timed contacts / 2 instantaneous contacts- 3 A. * ET - timed on voltage application : shunt or not terminals n° 3 and 13, timing is made on voltage application between 13 and 16 through a control contact. * MT - timed on voltage lack : permanent voltage application between 13 and 16, relay energizing by closing the control contact between 3 and 13 (control by the -), timing on operate when opening the control contact.